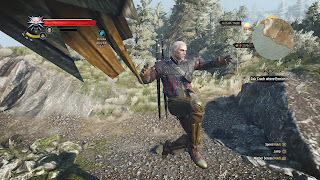 Mutagens are organs and body parts of all different kinds of monsters that can be used by the Witcher to enhance his abilities. While this sounds rather gory, they are shown as little spiky spheres instead of hacked off limbs and entrails. So no butchering to enjoy here. 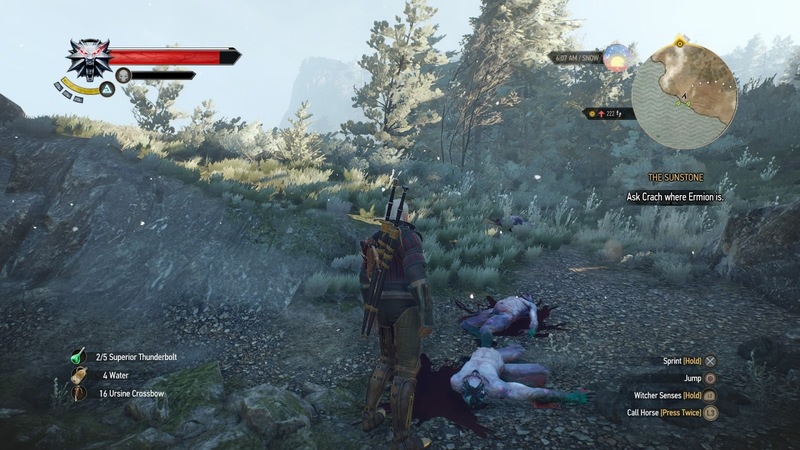 Any monster can drop mutagens. When you hear that every monster type drops its own mutagen, you automatically assume that there will be a big variety of different effects found on these mutagens. But it turned out that there are only 3 different effects on mutagens (more attack power, more magic power or more health). It came as a surprise for me that the mutagen of a werewolf has the same properties like that of a wyvern or an undead water hag. Mutagens will soon flood your inventory. They don´t stack although they are mostly the same. In my eyes, this is a missed opportunity. If mutagens had a broader spectrum of effects, it would have been an additional motivation for the player to hunt after the mutagens that suit his playstyle the most. 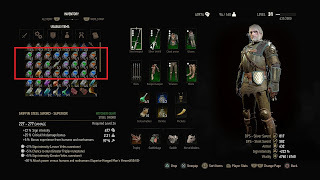 There could even be some randomness involved into the properties of the mutagens, so that not every werewolf has the exact same mutagen like any another werewolf. 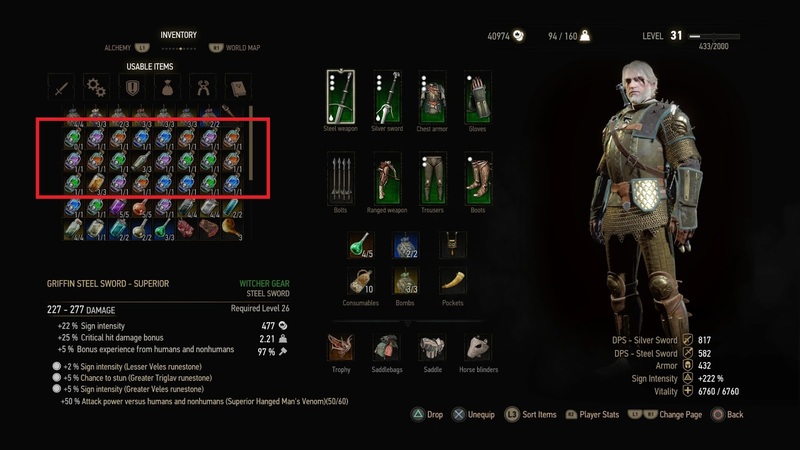 While the item hunt would be a nice added incentive for monster hunting, in the current state of the game it would be very dangerous to implement from a balance perspective. Through mutagen linking (see next section) you can greatly enhance the effect of a mutagen. Witch this great impact on player power, tossing in additional mutagens would have to be carefully balanced and the risk for breaking balance is immense. 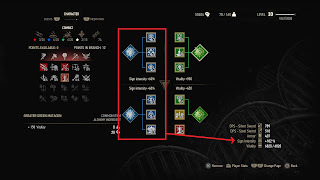 You can link a mutagen to up to 3 of your talents with the appropriate color and each link will double the effect of the mutagen. With correct talents, this can go up to multiplying the mutagen´s effect by 6 times. Keep in mind that doubling anything is already dangerous enough for a game´s balance. It is most apparent for the attack / magic power mutagens. In my case, I have 2 magic power mutagens (out of 4 available mutagen slots) fully supported. This grants me 120% additional sign power. In comparison, equipment and other talents only add a total of 62% to that number. This makes blue and red mutagens the most powerful tools to improve your character. Correct mutagen linking is not a bonus, it is mandatory. Because mutagen linking is so powerful, it makes using any off-color talents a huge punishment to the player as he drops so much of his power by doing so. 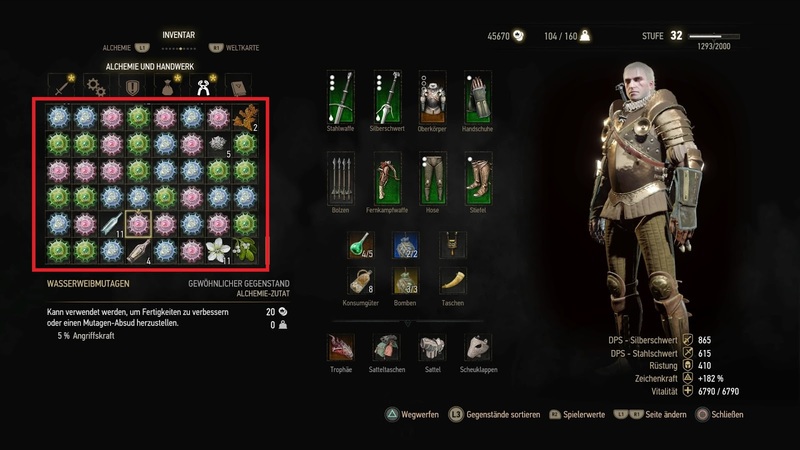 The talent system of Witcher 3 already has a strict limitation of a maximum of 12 active talents, forcing you to deactivate many of your acquired talents. The color limitation imposed by mutagen linking further adds to the restrictive nature of the talent system and might be overdoing it. My suggestion here would be to reduce the bonus provided by mutagen linking but increase the base effect of the mutagens. In the end, you would arrive at similar values when the mutagen is fully supported, but it would feel less punishing if the player uses an off-color talent because the linking bonus would not be that huge. These alchemical products are touted to be very potent, but during my playthrough I tested each newly available decoction and was always underwhelmed by the effect. I rarely used them a second time. 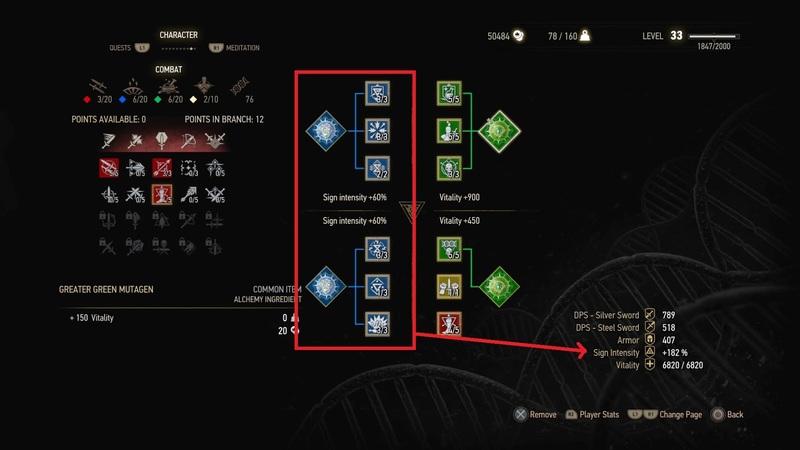 Until I found the Ekhidna decoction (regenerates health when you spend stamina, and yes, jumping counts) which was so overpowered I also decided to not use it to preserve the challenge of the game. Hopping around is your best healing strategy while under the effect of Ekhidna decoction. My problem with mutagen decoctions is the inconsistency of their power level. Some are just gimmicky (more damage in mounted combat), some have a barely noticeable effect, some are situationally very powerful and some are so strong that they render all other decoctions useless (e.g. Ekhidna). Due to the sheer number of decoctions (approx. 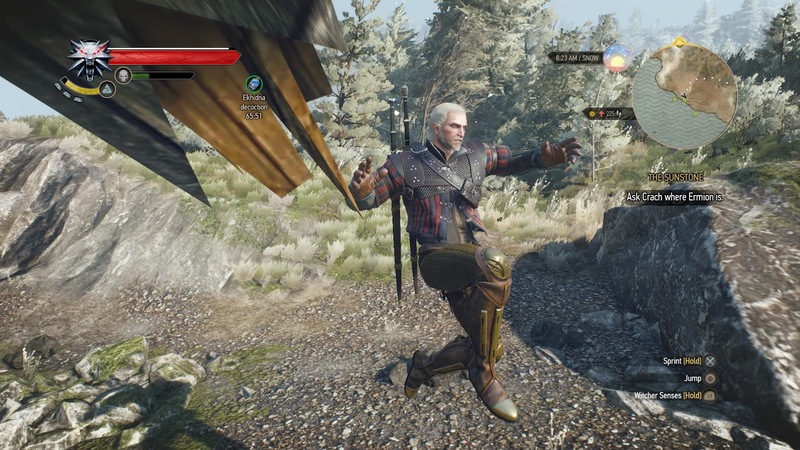 28), a rebalancing would be a monumental effort which I don´t think is possible any more for Witcher 3. It is pretty obvious that the Ekhidna decoction could need a nerf, e.g. 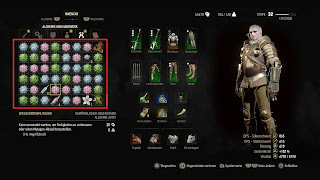 health regeneration should be based on the amount of stamina consumed (so the ridiculous hopping is no longer the most effective method of healing), and the healing should not apply instantly but as a healing over time effect that is replaced when you perform another stamina consuming action. I also dislike the decoctions where a small passive bonus increases as the fight goes on. Combat in Witcher 3 is usually a quick and brutal affair where the biggest danger are the first few moments of a fight when you are outnumbered or don´t know the enemy attack patterns too well. Having a decoction that slightly increases health regeneration with each enemy killed but stops at soon as combat ends, is not exactly well-tailored for my needs. The sheer number of different decoctions is staggering. In general, having gimmicky and situationally powerful decoctions is acceptable when the decoctions that are useful in all situations, like Ekhidna, do not outshine them in all cases. Because being stuck in a tight spot realizing that a certain decoction that you never cared about will help you greatly in this particular situation, is a very rewarding feeling. When I think of it, designing the effects of mutagen decoctions with the goal to counter specific powerful enemies would be a good design strategy. Do you want more screenshots? Subscribe to the blog and get access to the exclusive archives with unused content, PDF articles and more.